In the tradition of Clementine and Ramona Quimby, meet Bat. 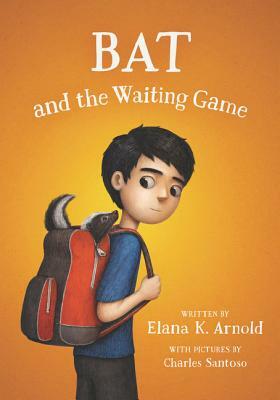 Author Elana K. Arnold returns with another irresistible story of friendship in this widely acclaimed series starring an unforgettable boy on the autism spectrum. For Bixby Alexander Tam (nicknamed Bat), life is pretty great. He’s the caretaker of the best baby skunk in the world—even Janie, his older sister, is warming up to Thor. When Janie gets a part in the school play and can’t watch Bat after school, it means some pretty big changes. Someone else has to take care of the skunk kit in the afternoons, Janie is having sleepovers with her new friends, and Bat wants everything to go back to normal. He just has to make it to the night of Janie’s performance. . . .
Elana K Arnold is the author of many books for and about children and teens, including Printz Honor winner Damsel, National Book Award finalist and Golden Kite winner What Girls Are Made Of, and Global Read Aloud selection A Boy Called Bat and its sequels. Several of her books are Junior Library Guild selections and have appeared on many best book lists, including the Amelia Bloomer Project, a catalog of feminist titles for young readers. Elana teaches in Hamline University’s MFA in writing for children and young adults program, and lives in Southern California with her family and menagerie of pets. You can visit her online at elanakarnold.com. Charles Santoso loves drawing little things in his little journal and dreaming about funny, wondrous stories. He lives and works in Sydney, Australia. You can visit Charles online at www.charlessantoso.com. A winsome blend of humor and heart, vibrant characters, and laugh-out-loud dialogue. Arnold’s narrative also gracefully explores life through the eyes of a boy on the autism spectrum. The ever-lovable Bat is sure to resonate with readers of all ages.